If you like coffee, they tell you to buy a coffee maker. If you like espresso, they tell you to buy an espresso maker. But what if you like both? 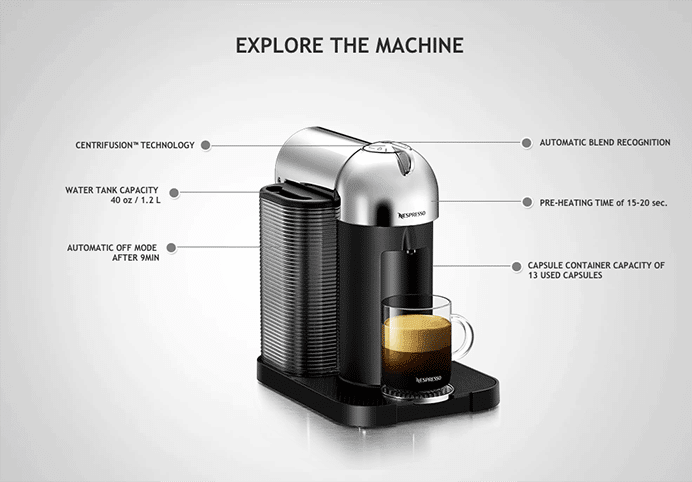 Nespresso VertuoLine is a single-serve coffee maker that can be used to brew gourmet espressos and traditional coffee. You've probably heard of the Nespresso brand, but this is the first time that they've designed something so dual-natured and multi-functional. They've also pumped up their features to make sure that their units can deliver customized cups of all sizes, flavors and froth levels. So what are the exact specs of this miracle machine? Is the price tag worth it? What should you expect when you take it out of the box? Let's do an in-depth review of the Nespresso VertuoLine. If you're in a hurry, jump straight to our Verdict section. With a nice variety of features and a sleek, modern design, the Nespresso VertuoLine will look great on your countertop and function twice as well. The Nespresso VertuoLine is a single-serve machine that makes one cup of java at a time. Instead of brewing an entire pot, you simply stick in a "pod" for making either coffee or espresso. Each purchase of the Nespresso VertuoLine comes with 14 complementary pods, and they offer a range of flavors, textures and aromas. One of the benefits of a single-serve coffee maker is that you can experiment with different blends without worrying about the possibility that you'll hate something and waste an entire pot on it. The design of the Nespresso VertuoLine is very simple. There's a compartment for the pods and a front-facing button for getting your brew started. It has a removable water tank that can be easily accessed for filling, emptying and cleaning. Some models come with a detached milk frother that can be used in conjunction with the machine. Never again drip coffee all over the place because your mug doesn't fit under the machine! One great thing about the Nespresso VertuoLine is that you won't have to wait around all day for your morning brew. It preheats in less than 20 seconds, so even if you're running around in a mad dash to get to work on time, you can still grab a cup of coffee before heading out the door. As for actually brewing that coffee, you're in luck. The Nespresso VertuoLine is ridiculously easy to use. Everything is done through a single button, so there are no fancy controls or high-tech menus that you need an entire manual to decipher. Just insert the pod, close the compartment and let the Centrifusion process take over. Don't worry; we had to look it up too. It's the name of the technology that Nespresso uses in their coffee makers, and it's actually pretty impressive. Once you hit the button, the machine starts spinning the pod at 7,000 rotations per minute (RPM) to blend your mixture to perfection. It will even produce crema if you told the unit to do so. All in all, it's a great layer of technology for an amateur, at-home coffee maker. You might be surprised that a small-ish machine can pack such a punch, but it's true. Measuring 11.9 x 8.3 x 11.9 inches and weighing a little more than 10 pounds, the Nespresso VertuoLine isn't one of those monstrous coffee makers that takes up all of your counter space. You can just slot it into whatever available room that you have between your toaster and blender. As for style, the Nespresso VertuoLine is available in red, black and chrome, so you can buy the specific color that complements your kitchen design. Did we mention that some models of the Nespresso VertuoLine also come with their own milk frother? Add crema to your cup to give it that rich flavor and lusciously smooth texture. It can be made hot or cold, to the sky is the limit when it comes to a personalized cup of coffee. The Nespresso VertuoLine is also a breeze when it comes to clean-up. The pod will automatically eject itself from the machine after your brew is finished, and your unit can hold a dozen empty pods before they need to be removed. This gives you a little leeway when it comes to maintenance. You don't have to clean up after yourself every single day. If you have any questions before or after your purchase, you can contact Nespresso's customer service hotline at 1-877-964-6299. It will brew single cups instead of giant wasted pots. One-button technology makes it easy to use. You can adjust everything from its cup size to its brewing type between coffee and espresso. With a higher price tag than the competition, some of the flaws of the Nespresso VertuoLine might give you pause. While the Nespresso VertuoLine is a solid coffee maker all around, it isn't without its drawbacks, and you should consider them before investing in such an expensive machine. Yes, we said "expensive." Retailing at anywhere from $150 - $200 depending on the store, the Nespresso VertuoLine isn't the kind of product that you buy on a whim. You'll need to be sure that it has the functions and features that you desire in a coffee maker before whipping out your credit card. You'll also have to buy new pods to replenish your machine whenever you run out. This is no different than having to buy new beans for a regular coffee maker, but it's still something to keep in mind, especially if you're a fan of buying big multi-packs of flavor pods. While the individual pods are only $1 - $2, the multi-packs can cost you as much as $50. Another disadvantage of the Nespresso VertuoLine is that it only accepts Nespresso-brand pods. You won't be able to use it with coffee and espresso pods made by other companies. While nothing will actually stop you from inserting a strange pod into your machine and turning it on, it won't brew correctly and won't be worth the effort of even licking your finger to taste it. How are we so sure that the pods won't brew correctly? Well, the Nespresso VertuoLine comes with barcode-reading technology that automatically recognizes its individual pods. It's a great feature for brewing specific flavors to perfection, but it means that the coffee maker just won't know what to do with any "unrecognized" or "unauthorized" pods. Its price tag is on the higher end of the scale. It can only be used with brand-specific coffee and espresso pods. The good news is that there are plenty of flavors and aromas to keep you occupied. Nespresso offers more than 150 pods for the VertuoLine, including ones that taste like vanilla, hazelnut and bourbon. There are also decaf pods available. Is the Nespresso VertuoLine really worth the purchase? While the Nespresso VertuoLine might not be the fanciest coffee maker on the market, it's more than enough for people who just need a good cup of coffee to get them going in the morning. It offers single-serve technology, so you'll never waste any beans or grounds with an overly-large pot. It can be adjusted to brew coffee and espresso, so you'll always be able to create the exact beverage that you want. Whether you're craving a frothy, milky espresso or some black get-me-through-this-meeting sludge, the Nespresso VertuoLine will provide. The Nespresso VertuoLine does come with a few flaws, but what coffee maker doesn't? If you're a fan of Nespresso, you don't even need to buy off-brand products. Just stick with the label that you like. They certainly offer enough pods to keep your morning tastes exciting and diverse. All things considered, we'd give the Nespresso VertuoLine a solid thumbs up. It might not change your life, but it'll wake you up in the mornings and allow you to create customized cups of coffee depending on your mood. At the end of the day, that's all you can ask of a coffee maker.